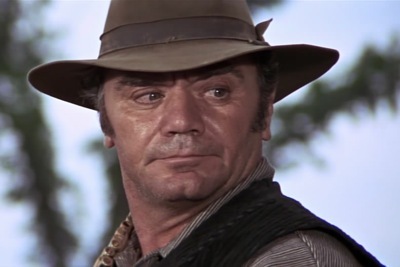 So says Ernest Borgnine in his autobiography when referencing co-star, Glenn Ford, as he recalls both his friendship and working relationship with Glenn on this Joseph Pevney directed feature for MGM. 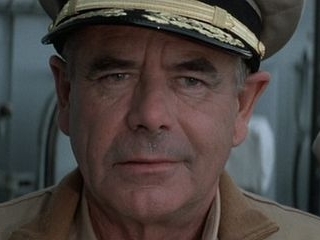 Ford at this time in his career is a natural choice to play a submarine commander and it’s not much of a stretch to see Ernie as his loyal second in command either. It’s 1942 in the South Pacific and Ford is a commander placed under enormous stress as only a Hollywood script can bring upon a sub captain. In flashback sequences that run throughout the film’s 95 minute running time, Ford is a family man with a wife played by Diane Brewster and a little girl to call him Daddy. The pair have been reported missing after the Japanese overrun Manila where they were living at the outbreak of the war. For this reason Glenn isn’t smiling much though Ernie keeps leaning to the side of hope. 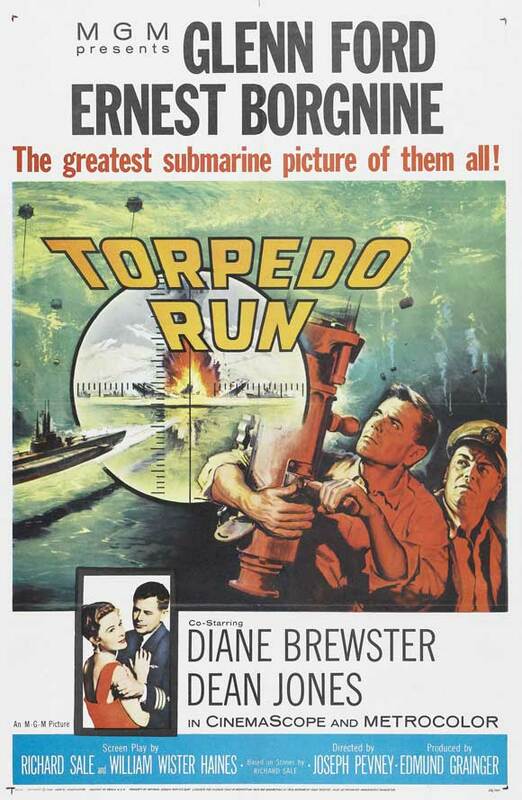 Scoring fourth billing and a spot on the poster is Dean Jones as a young officer on board that Glenn rides hard when it comes to navy etiquette and getting the job done. He’s quick to tell the youngster, “Sorry is a word for funerals.” For a brief moment or two in the story, Glenn is all smiles when word comes down that his family has been found alive in an internment camp. It’s a short lived joy. Orders come down that Glenn and Ernie are to attack a Japanese aircraft carrier that is the most sought after target by the U.S. Navy. It’s heavily guarded with destroyers and using a civilian filled ship to run interference and one that’s meant to take any incoming torpedoes. You bet. Glenn’s family is confirmed to be aboard that same ship. Glenn’s got a job to do and Ernie’s firmly against firing any of the “fish” at this time. And so here’s the “hook” in the Richard Sale script used as a melodramatic plot device. Sure seems a stretch to me but injecting items like these are meant to keep us on the edge of our seats I suppose. Silly as it is, the boys make it work and never once wink at the camera. I’m not about to confirm one way or the other whether Glenn gives the order to fire upon his family. But, I will state with some nifty Oscar Nominated Special Effects, the sub will find itself in Tokyo Bay looking to wreak havoc with the Japanese Fleet. 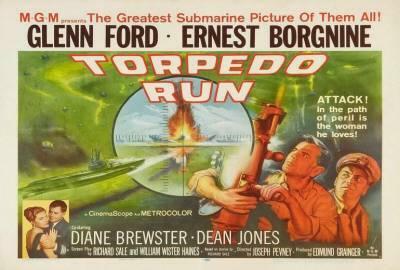 Far from a “B” film, Torpedo Run still falls back upon most of the usual ideas we’ve come to expect in a claustrophobic tale of the deep. A disagreement is bound to occur over procedure between the two leads which threatens to fracture their friendship, solar pings echoing while the crew including L.Q. 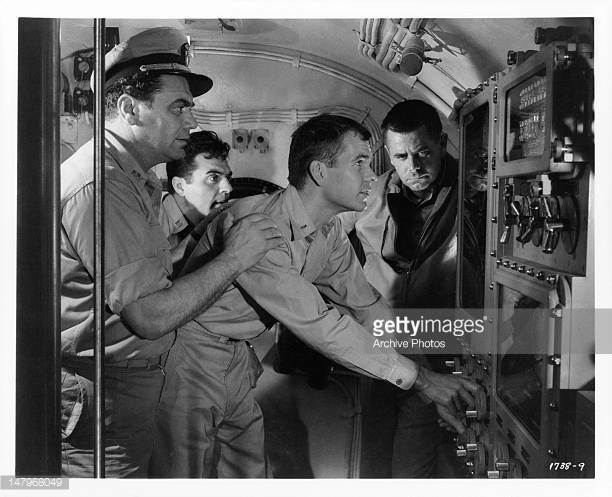 Jones sweat it out as depth charges free fall all around the sub, and of course orders being issued include, “Dive,” All ahead full.” and the all important, “Fire torpedoes!” and with every order comes the confirmation repeated right back towards sub captain Ford. While this may be passable entertainment overall, it’s far from either actor’s best film and nowhere near as good as their previous collaboration, the adult themed, Delmer Daves western, Jubal. Ernie was a real life Navy veteran before heading to Hollywood and one of the longest careers on record while Ford went into the Naval Reserves, remaining active till his senior years. 1958 would prove to be the pinnacle of Ford’s career as a leading man. He landed atop the annual actor’s poll for the top ten box office attractions while Liz Taylor was runner up in second. Trivia? How about two trivia questions instead meant for the non professional movie buff. Name a movie Borgnine and L.Q. Jones reunited in that some consider the greatest western ever made. 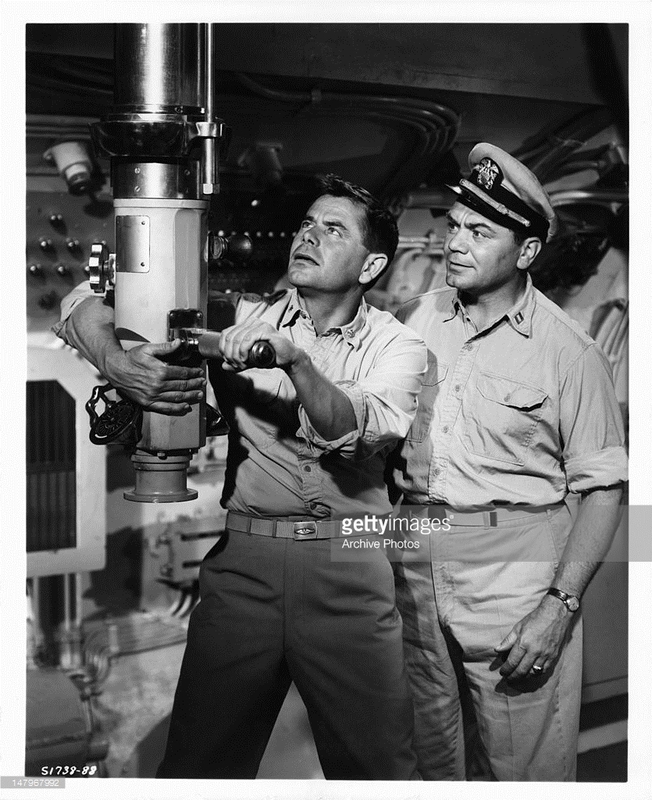 Secondly, what 1970’s movie did Glenn Ford star in along with a heavyweight cast re-enacting one of the major battles that the U.S. Navy engaged in during WW2? 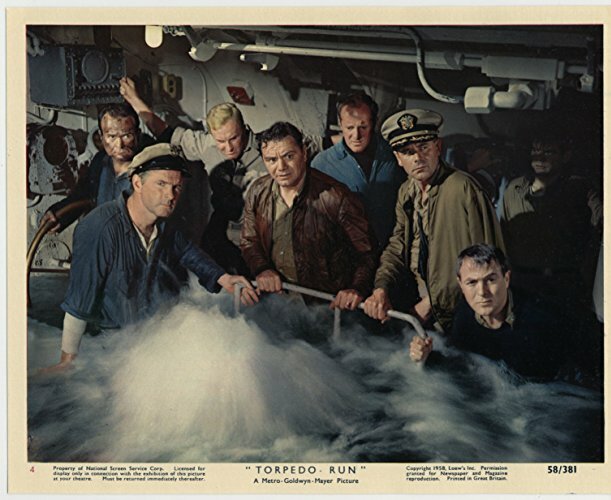 If you like these submarine pressure cookers, another 1958 release you might want to check out that competed for box office dollars with Torpedo Run is Run Silent, Run Deep with another pair of heavyweight actors on board. Wanna see Torpedo Run? It’s on TCM on occasion or if you’re a collector like me you can score a copy through the Warner Archive Collection. Sounds like a good one! I’ve seen more recent sub films, but not many older ones…I think ‘Yellow Submarine’ would be my oldest, and that doesn’t really count as a WWII film! And my guesses at your two trivia questions: The Wild Bunch and Midway? Saw Das Boot years ago and a few others. I do like Run Silent, Run Deep. Like Boxing movies, they offer up a steady dose of thrills and it’s hard to really go wrong. Hunt For Red October another really good one. And yes, you win the soundtrack to Yellow Submarine for those answers. Feel free to order it anytime on Amazon. Send me the receipt and I might refund you the money. Heavy on the might. I just checked the site, and the date isn’t clear…is it in June or October? Are you staying at the Double Tree? They haven’t updated everything but I’m arriving for the June show on Thursday the 21st. Leave Sunday. I stay next door at super 8 this year.